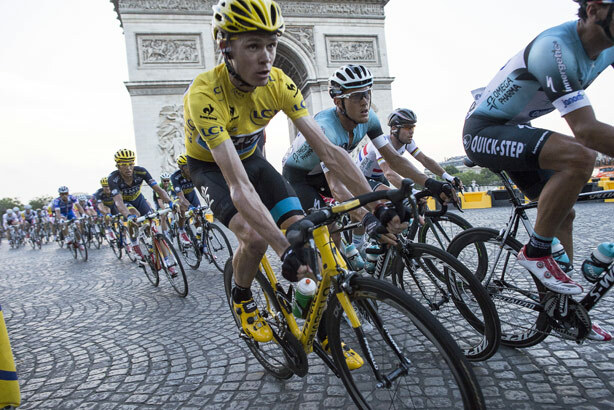 The Tour de France begins tomorrow with the first stage 'Grand Depart' to take place in Yorkshire and two further stages taking place in the UK before heading over the channel to France. McCain has used the opportunity of being an official supplier to the Tour to commission a 4,550 square metre image of a scarecrow in a McCain potato farmer's field at Alton Farms. 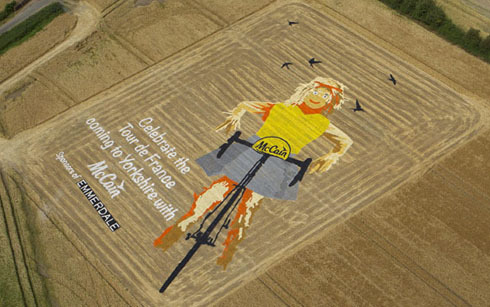 The image was created by a team of field artists over five days using bio-degradable paint and captures one of the McCain's scarecrows, used as the idents to ITV's Emmerdale, in a yellow jersey riding a bicycle. The image is best seen from the air but fans will catch a glimpse of it as the race travels down the A59 at Hammerton during Stage Two of the Tour on Sunday morning. It is working with sport-focused agency Pitch on promoting the stunt. P&O Ferries is an official supporter of the Tour. 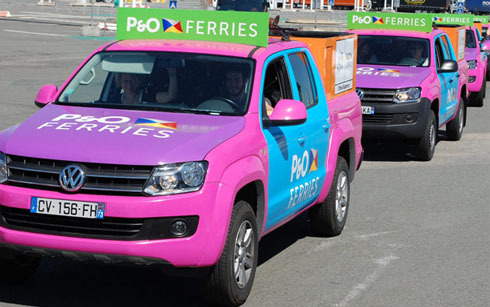 Promotional cars joined the Tour’s ‘caravanne’ to board one of its ferries at Calais yesterday, along with around 700 official vehicles, with another 300 arriving via its Zeebrugge – Hull service. P&O said its sponsorship interest was driven by a strategy to raise its profile on the continent and to try and balance the trade it does with UK travellers. It said it would leverage the high profile of the race with PR activity at the start and finish of each stage, including competitions to win VIP access to each stage and Team Sky cut outs on ferries for people to pose for pictures, which will be included in a social media element to its campaign. "Nothing reminds me better that this is the Tour de France than seeing French police streaming off a ferry on to our roads," said Brian Rees, head of public relations at P&O Ferries. Orange is an official partner of the Tour and will provide organisers and the media with the communications and technology network for the duration of the race. It has also devised a system to allow fans of the race to follow the highlights of the competition on mobile and tablets in real time via an online portal. Orange customers will also be able to access exclusive race content on their mobiles and tablets, including real-time rankings, analysis and interviews. As such, a spokeswoman for Orange said the focus for the PR team will be about "promoting our expertise in delivering the high-level technology required". This will include organising press tours, which a focus on technology press in particular. On Monday, for example, media will be invited behind the scenes and given the opportunity to interview the company’s technical director Henri Terreaux. Haribo UK, based in Yorkshire, is also an official supporter and will be taking to the roads along the official route as part of a process of elaborate floats that pass through the Yorkshire stages two hours before the riders pass by. The company will use two branded vehicles stocked with 60,000 packets of Starmix and Tangfastics to give out to supporters as they watch the race during the first three stages.